Our Funarena! : Team Anna: Ifs, Buts and Whys! The core committee meeting decided today that there would be no restructuring or expanding the present Team Anna. They also said their movement was not anti Congress and that the charges and allegations against certain members are part of a smear campaign led by vested interest groups. 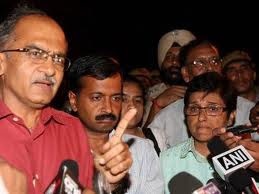 Problem is the core committee meeting was commanded only by the disputed trio—Prashant Bhushan, Arvind Kejriwal and Kiran Bedi. Crucial members who criticized them, who wanted Team Anna to be suspended, who termed Kejriwal and Bedi as the most arrogant members of the team and who protested the clear political turn Anna’s movement was taking. Now, if you call the charges as part of a larger smear campaign this translates into saying that the Congress party told Prashant Bhushan to make that Kashmir comment, the Congress party invited Kejriwal to oppose them in their own election and also advised him how to embezzle funds without keeping accounts and the Congress party had been backing Kiran Bedi all the time in overcharging the hosts! The comedy circus rolls on! Team Anna’s movement had identified Congress with Corruption. And now, they have said their movement is not anti-Congress! Does it mean that their movement has stopped to be anti Corruption? They will again be anti-Congress (or Corruption?) if their basic demand is not met by the year end. What a joke! Has Anna Hazare fallen prey to such arrogant and people-made-most-powerful leaders? He must break his vow of silence immediately and answer all the questions.